44th Anual Al Johnson Photos – FREE, but consider making a donation to the CBAC. We’d appreciate it! 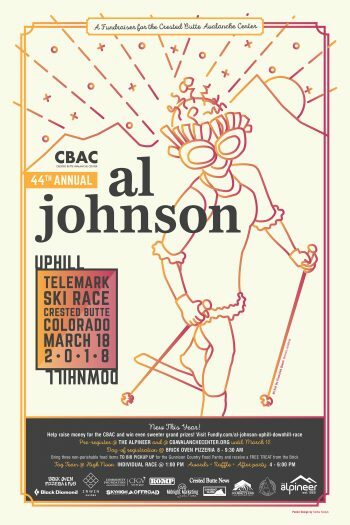 Join the Crested Butte Avalanche Center in honoring the true roots of skiing in Crested Butte, the way Al Johnson, our USPS mailman did it. With free heels. Help the Crested Butte Avalanche Center raise necessary funds to keep the forecasting going EVERY DAY, ALL WINTER LONG. Use the power of social media and share our mission with your friends. Prizes will be awarded for most money raised by a team and most money raised by an individual! COLLECT PLEDGES – AND WIN PRIZES! You can also still register in person at the Alpineer until March 16, and the day of the race at the Brick during bib pick up between 8 and 9:30am the morning of the race.